The artist Joseph Beuys speaks of a dialogue with his surroundings that positions his work in such a way that it acts like it is receiving an electronic signal, like a transmitter. Perhaps this approach is due to Beuys’s early military training as an aircraft radio operator, but, more importantly, the epistemological discourse within his practice established direct relevance to current trends, and reaffirmed his interest in science and performance. Beuys marketed himself through a personal mythology, and he recognized how an emphasis on branding, and its cause and effect, put him way ahead of the game. Like Beuys, Monroe is interested in branding. 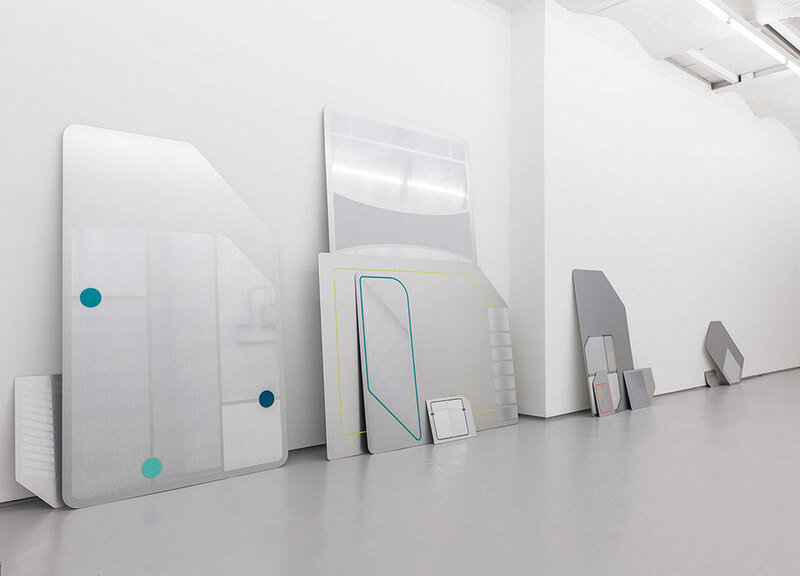 In his current show, S.I.M., at Fold Gallery, the idea of a ‘fast-branded super-overall-processed look’ is dramatically articulated, firstly, through a consummate editing process, both within the curation of smaller and larger pieces, and secondly, through the assembling of sculptural forms, carefully composed throughout the three zonal spaces. The compilation of events are vertically organized, as in Station. The aluminium, steel and glass elements intensify an unidentified corporate world, the production and atmosphere softened by the coloured strata of the carpet tiles. A paperclip is casually hung on the handrail. Cellular networks erupt through a volumetric object, perhaps hinting at the photographic work of Thomas Demand, in whose work the stillness and collaged nature of the work evokes an uncanny presence within the photocopier or fax machine. The vinyl-coated painting Modern Ergonomics has an angled entry space into the picture. I particularly like the use of perspective and semiotisation of the synthetic environment, at one moment virtual, then real; almost untouchable. There is a duality in the reading of the work. Monroe is so efficient that we can’t see the hand in the way the work is constructed. His invisible use of the scalpel blade and vinyl-cutting machine allows a deadpan but psychological implication of the scientific. Or perhaps it calls to mind the area where characters are beamed up in Star Trek. But I like the way in which the paintings have the feeling of a Patrick Caulfield painting – particularly his interior paintings. like Dining /Kitchen /Living (1980), in which the everyday objects and scenes are frozen. The colour combinations are complex and highly built up. As in Monroe’s work, Caulfield’s paint surface is immaculately rendered in a flat. non-emotional manner, which transports us to a moment in time. Monroe enjoys creating a situation in which he slides the viewer back in time; for example, his work based on 1970s speakers which use sticky-back wood-grain to depict the encased wood veneer. In this show the desirable accessory for the aspiring yuppie, a Filofax, Dossier 2017, takes that cue. The outsized paper clip shifts just outside the structure, in the constructivist tradition. The composition calls to mind Malcolm Hughes’ Double Unit Prime Number (C1 & C2 ), also made in the early ’80s. The diagonal glass is sharply sliced to reveal the Filofax, perhaps with its timetables and ‘to do’ lists or, more darkly, a dossier on certain individuals. Humanity hides behind the closed doors and the suggestive shapes that span one side of the gallery. Each Dibond aluminium composite plate is named after an unknown person. The graphic interface, printed across the surface, presents geometric signposts, or signals, which orchestrate the continuum of the space, integrating the zones and depicting a sense of storage and retrieval between the works. Beneath the brilliant surfaces lurk Monroe’s preoccupations with the spatially or structurally impossible. The decision procedures between work and home can be seen in House of the Industrialist. A seamless interaction seems to be taking place, as the objects of everyday living are suspended and are about to replace the working environment. If you stand close to this painting, the eye perceives a succession of relationships between the colour and structure of individual objects, and the illusions of space. The viewer is propelled through a perceptual paradox, in that our eye can’t quite predict how the fusion of forms will take place. But the series of perceived effects still elicits memories of place. This is built on by the deep violet in the work Memories. The decisions in this work relate to Josef Albers’ exquisite interactions of colour, turning three colours into four. But also, the SIM card, with its shiny social organisation, holds within it the latency of the past and the indeterminacy of the future. In Bureau I am reminded of Carl André’s three sculptural phases: sculpture as shape, sculpture as structure, sculpture as place. One immediately scrutinizes these relationships and the continuing sense of technological innovation that the small screen within the printer solicits in its dialogue with its surroundings. The feeling of the the half-submerged (thinking of recent hurricanes in east-coast USA) is key here, as Monroe brings together systems (perhaps suggesting weather systems) and in some way questions events that are outside our control. Monroe’s agglomeration of the private and public is inherent in his approach. We tune in to the machine that is capable of solving problems in a society; perfect and controlled. Monroe’s early collage work still feels important in the way ‘stuff is put together’. But this utopian discourse is aligned to a sense of performance that underpins the rigour of the process. Perhaps like Beuys, Monroe’s sense of action is what captures people’s imagination. The connection to architecture and assemblage feels brilliantly emphasized in Monroe’s work. He interrogates the movements crossovers and linkages, by pushing a sense of anxiety in the viewer. We perhaps therefore get a simultaneous reaction to the work; from a fascination of how technologies shift our relationships to everyday operations, and the fear that consumes us as that technology replaces the technologies we have become familiar with.